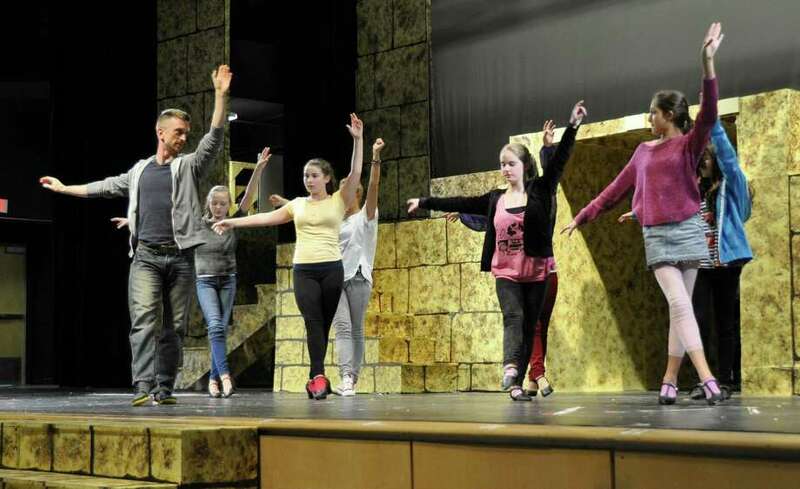 Associate choreographer Mike Kirsch, left, works with dancers on the "Go, Go, Go Joseph" number during a rehearsal for Bedford Middle School's production of "Joseph and the Technicolor Dreamcoat." The Bedford Middle School Drama Department will present four performances of the musical "Joseph and the Amazing Technicolor Dreamcoat" the weekend of Nov. 30 to Dec. 2 at the school. The show is an upbeat version of the Biblical tale of Joseph and the coat of many colors, retold in the music of Andrew Lloyd Webber and Tim Rice. The Bedford production features a cast of more than 65 students. In the Old Testament's Book of Genesis, Jacob has 12 sons. Joseph is his favorite because he has prophetic dreams, and the father gives him a multi-colored robe. Joseph's 11 brothers are jealous, so they take his special robe and sell him into slavery. The brothers dip the multi-colored robe in goat's blood and return it to Jacob, who concludes Joseph has been killed by an animal. But after a time in jail, Joseph becomes a trusted prophet for the Pharaoh, who puts him in charge of all land in Egypt. With a famine, people from all countries need food and come to Joseph for grain. Among them are his brothers, who don't recognize Joseph and grovel at his feet. Joseph ultimately forgives them, and the family is reunited. Popular songs in the musical include "Any Dream Will Do," "Jacob and Sons/Joseph's Coat," "Close Every Door," and "Those Canaan Days." The musical opened in London's West End in 1973 and on Broadway in 1982. Bedford performances are planned Friday, Nov. 30, at 7:30 p.m.; Saturday Dec. 1, at 2 p.m. and 7:30 p.m.; and Sunday, Dec. 2, at 2 p.m. Adult tickets are $15 for center orchestra section; $12 for all other adult seats. ; $10 for students and children. Tickets are available at http://bedfordactinggroup.com or at the door. For more information, call 203 341-1567.